Recently a new 10-year, $100 million dollar initiative was announced: a project called Breakthrough Listen. The project will use two of the world's largest radio telescopes in an attempt to look for radio signals from extraterrestrial civilizations. It's a new jolt of cash to SETI (the Search for Extraterrestrial Intelligence), and has largely been funded by a Russian billionaire named Yuri Milner. We can be sure that this money will be spent in very conventional ways. 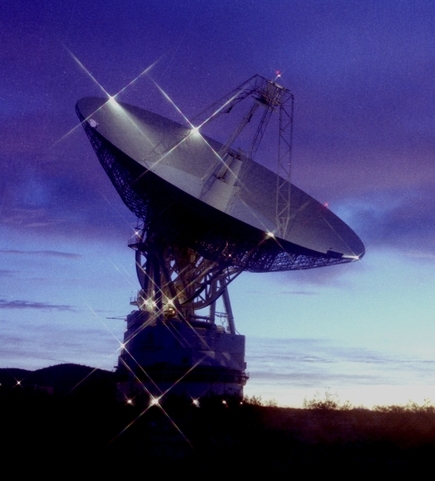 Virtually all of it will go for listening to radio signals using big radio telescopes like the one shown below. Our scientists seem to be fixated on big machines. It is as if they are thinking: the way to make a big discovery is to use a big, big machine. But I can imagine some ways in which you could conduct a search for extraterrestrial life without using big machines. Some of these ways would involve searches very different from looking for radio signals from distant planets. One method would be to investigate all the evidence suggesting that we may be visited regularly by one or more extraterrestrial civilizations. Currently the analysis of UFO sightings is done only by poorly funded organizations and private individuals. Just think of what might be found if, say, 1 percent of that 100 million dollars was devoted to investigating this topic. We might find very good evidence of extraterrestrial life, which is the very thing SETI is supposed to be looking for. Another method would be to look at the human genome for evidence of the non-natural. We might find some evidence that someone tinkered with human DNA, and such tinkering might have been done by extraterrestrial visitors that came here and modified our DNA. Or we might actually find some message left behind by extraterrestrials who came here long ago and modified our DNA to leave some message inside it. This is a fascinating idea that was charmingly presented in an episode of the television series Star Trek: The Next Generation. DNA contains nucleotide “letters” that could be used to spell out any imaginable message. Such a message could be included in the “noncoding” part of DNA that has no known purpose. Another way in which we could search for extraterrestrial intelligence without using big machines is to investigate crop circles. These mysterious things have so far only been investigated by poorly funded private researchers. But what might we learn if a million dollars or two were spent investigating these anomalies? We might get some proof that these mysterious things are of extraterrestrial origin. Another way in which we could search for extraterrestrial intelligence without using big machines is to systematically investigate photos taken in our solar system of Mars and other bodies, looking specifically for traces that may have been left behind by extraterrestrial visitors. Currently the only people who do this are poorly funded individuals, but with even minimal funding some very interesting photos have been found. We can only wonder what might turn up if a million dollars or two was devoted to such an investigation. Still another way we could search for extraterrestrial intelligence is to investigate fully the photographic anomaly of orbs. These strange anomalies are showing up repeatedly in photos, often as objects that look too big to be dust, too bright to be dust, too fast to be dust, and too colorful to be dust. These anomalies cannot be generally explained as dust particles, because (as explained here) the blockage fraction of dust particles in ordinary air are too small (a particle of dust in typical outdoor air blocks only about 1/15000 of the area right in front of a camera). Could it be that orbs represent some strange extraterrestrial life form that has come to our planet? We might find out by spending perhaps a thousandth of the 100 million dollars recently allocated to SETI. Still another way we could search for extraterrestrial intelligence is to try making use of clairvoyance or ESP. If extraterrestrial civilizations are millions of years more advanced than ours, the minds in such civilizations may have psychic abilities that dwarf any that a human being has. There may therefore be some chance of leveraging such a possibility. We can imagine a program that could search for humans with relatively strong ESP or clairvoyance, and then use them in an attempt to receive telepathic messages from extraterrestrials (or at least some indication of which corner of the sky they live). Such an impression might be received if there are extraterrestrial superminds out there with something like super-telepathy. Such an approach could be carried out at relatively tiny expense, so it might be worth trying, even if it is highly unlikely to succeed. These are all interesting and inexpensive alternative ways in which we could search for extraterrestrial intelligence without spending much money, and without using big machines. But I think it unlikely that any of them will be undertaken by the new SETI initiative. Instead, almost certainly that initiative will follow the conventional mainstream wisdom regarding the search for extraterrestrial intelligence: the principle that when looking for aliens, we must put all of our eggs in one basket. Part of the reason is a kind of “big iron” fixation that dominates the minds of scientists. The thinking is kind of like this: the bigger the machine you use, the better your chance of success. So scientists build incredibly expensive machines that often produce modest results, when the same funding (used to fund a hundred little projects) would probably produce much greater results. But the main reason why SETI has been so narrowly focused may be perhaps that scientists want to find something consistent with their worldview, but don't want to find things inconsistent with their worldview. So they don't want to follow approaches that may lead them to what they are looking for, but also may lead them to other things they don't want to believe in. By getting involved in edgy SETI approaches, scientists might find the extraterrestrial civilizations they are looking for. But they might get evidence for things they don't want to believe in, and have declared taboo: things such as psychic phenomena, undiscovered spiritual realities, or some design in the origin of humanity. People who think there might be evidence we are now being visited by aliens are a bunch of kooks and crackpots. It's all too obvious that if aliens were here now, they would have a giant spaceship that everyone would see in the sky. Ignore anything strange happening in our skies when looking for evidence of extraterrestrials. The only sensible way to look for aliens is to keep trying to listen for radio signals (the same way we've been trying for 50 years without success). The wisdom of this attitude is by no means obvious. One problem is its fallacy of assuming that we can presume to infer what it would be like if extraterrestrials had arrived on our planet. Since extraterrestrials might have arisen many millions or billions of years ago, we have no idea whether they would still be using anything we could recognize as technology. For all we know, they could have evolved long ago into beings of pure energy that are now floating around in our skies. The other problem with this attitude is the insistence that the only viable search option should be to keep trying a technique that has not proven successful after 50 years. Imagine you had a very sick little daughter, and you knew that if you found out more about some medical treatment, you might save her. You would leave no stone unturned in your search for that knowledge. That is the approach that a good SETI program should take: damn the taboos, and leave no stone unturned in searching for extraterrestrials. But instead SETI programs seem to limit themselves to turning only one type of stone (the “radio signal” type of stone). While it still may make sense to use the lion's share of SETI funding on radio searches, a decent fraction of the budget (perhaps 10%) might be better spent on alternative SETI approaches. The history of science contains many cases of theories that were oversold by eager apostles. One of the main cases today involves the overselling of the theory of natural selection. In this case many of our biologists are representing as “settled science” the idea that natural selection is the main cause for evolution. The evidence for evolution is good, but the evidence is quite weak that natural selection is the main cause of evolution in large organisms. Let me clarify the difference between evolution and natural selection. Evolution is the idea that over very long periods of time, species very gradually undergo changes, developing novel adaptions to their environment, with such adaptions sometimes becoming sufficient for one species to evolve into a different species. Natural selection is a hypothesis about the cause of evolution. Natural selection says that evolution occurs mainly because organisms that are more fit to survive tend to reproduce more. Darwin introduced both the basic idea of evolution and the theory of natural selection at the same time, in a book entitled On the Origin of Species by Means of Natural Selection. But it is quite possible to believe in evolution without believing that natural selection is its main cause. The modern theory of natural selection is all centered around the idea of random mutations. The idea is that the blueprint of a species (found in its DNA) undergoes random changes called mutations, which might be produced by something like a cosmic ray hitting the DNA stored in a cell, or a random “copying error” when the DNA is not copied exactly right. In some cases, it is claimed, these random changes result in a change that is actually beneficial. When such a thing happens, it is claimed, natural selection causes the organisms that had such mutations to reproduce more often than some other organisms in that species which did not have such a mutation. It is claimed that this causes the mutation to be inherited more and more often in later organisms belonging to that species. Such a process, it is claimed, it so powerful that it can account for all kinds of astonishing adaptions in organisms. Now the question is: what evidence is there for this theory that natural selection is the main force behind evolution? Although there is lots of historical evidence for evolution (found in the fossil record), there is no significant historical or fossil evidence that natural selection has been the main cause of evolution in large organisms. Think for a moment of the difficulties of ever getting such evidence. In almost all cases when we have a fossil record of some organism that existed eons ago, we don't have DNA from that organism. Even if we had that DNA (from a few dead organisms), it would still not be enough to figure out the history of DNA changes in a species from long ago, and whether or not natural selection was the cause of evolution in a particular species. You start out with a population of organisms of some type, and you carefully record the DNA of all of those organisms. You track the evolution of these organism over many generations, while applying some factor that causes lots of mutations. The DNA of these organisms must be checked at very many times. You attempt to determine whether useful new adaptions are being evolved, and attempt to determine whether such adaptions (this new functionality of evolutionary novelty) are being produced by natural selection and random mutations. The experiments that have been done along these lines have produced very modest results. The study here studied 600 generations of fruit flies, finding no change more dramatic than a 20% shorter life cycle. Another experiment is Richard Lenski's long-term experiment on bacteria, which has tracked more than 60,000 generations of bacteria. The results of this experiment have been modest, with the main result merely being that the bacteria seem to have developed an ability to digest citrate that it did not have before. 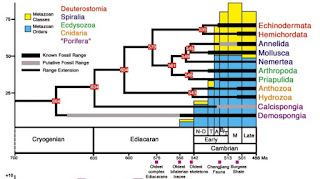 Documenting such an adaption is “peanuts” compared to demonstrating that a significant and complicated structural innovation (such as the human eyeball or a wing) did occur because of natural selection (something that no one has ever demonstrated). Even Lenski's meager result is subject to doubt, as a large fraction of scientific experiments are not replicated when another experimenter tries to replicate them (and in the case of Lenski's experiments, it will be decades before we can determine whether someone is able to replicate his results). There is a simple reason why experiments of such a type can never show that natural selection is the main cause of evolution in large organisms. The shorter the life cycle of an organism, the more likely it might be for it to evolve beneficial changes because of natural selection. Bacteria such as those in Lenski's experiment have a lifespan about 130,000 times shorter than a human lifespan, and can double their population in only about an hour. It is all too possible that natural selection is sufficient to cause useful adaptions in very short-lived organisms such as bacteria, but is not sufficient to cause useful adaptions in large, long-lived organisms such as animals as large as a dog or larger. But isn't there some way, in theory, that you could prove natural selection by using large long-lived animals such as mammals? Yes, in theory there is. But it has never been done, and would be a nightmare to do, as it would take ages. Imagine how the project might be executed. After building some special testing environment (perhaps some special large building), you would start out with a population of some large species with a lifespan of more than decade. You would take samples of the DNA of each organism in such a population. You would then monitor such a population over many generations, frequently taking DNA samples to see how the DNA was changing. Since a generation for such organisms would take at least a year, the project would have to probably last for thousands of years. All in all, it would be a project more difficult than landing men on Mars. No one has ever done such a project, or even one tenth of such a project. It would seem that for reasons such as these, the theory that natural selection is the main explanation for the evolution of large animals is one that simply is not very susceptible to experimental verification. But what about some other approach? What about some approach in which we get the predictions of the natural selection theory, and then try to verify that such predictions are coming true? But that doesn't work either. The reason is that the modern theory of natural selection is all centered upon the idea of blind chance. The theory assures us that natural selection will do random stuff we can't predict. So there is not much of a way to match up reality with the predictions of natural selection. For example, natural selection does not give us any predictions about what a particular organism will evolve to in the future. So there is no way to exactly match up predictions and reality when trying to get proof for natural selection. So from the standpoint of being verified, the theory that natural selection is the main driver of evolution in large animals is on incomparably weaker ground than other scientific theories which do make a host of exact numerical predictions that are repeatedly verified to the letter. Using a theory such as the theory of gravitation, one can make very precise predictions such as the prediction that a particular object released from a particular height will hit the ground 14.5 seconds after it has been dropped. Such predictions have been verified countless times. But the theory of natural selection has no such record of predictive success. Some of the things that are sometimes claimed as “successful predictions” of the theory (such as the discovery of something like DNA) are not actually predictions uniquely predicted by the theory. A nonbeliever in natural selection would have been just as likely to have predicted that something like DNA existed before it was discovered. Scientists at Penn State and the National Institute of Genetics in Japan have demonstrated that several statistical methods commonly used by biologists to detect natural selection at the molecular level tend to produce incorrect results. "Our finding means that hundreds of published studies on natural selection may have drawn incorrect conclusions," said Masatoshi Nei, Penn State Evan Pugh Professor of Biology and the team's leader. Given these items, one must wonder whether scientists scanning the genome, eagerly looking for faint traces of natural selection, are much different from UFO enthusiasts scanning photos of Mars and occasionally claiming to have found something important. Given a mountain of data, sufficient time and a huge toolkit of statistical methods to choose from, it is not too unlikely that you may be able to find “faint traces” of exactly whatever it is that you were hoping to find. I may also note that finding some statistical trace of natural selection would not by itself prove that natural selection is the main thing driving evolution in larger organisms such as man. It is entirely possible that natural selection is a relatively minor effect in species with long lifetimes, and the main thing propelling evolution is something else. There are also very substantial reasons for doubting that natural selection is the main thing that caused evolution in humans. The best reason I know of is the inability of natural selection to explain dozens of human mental faculties and traits that do not seem to be adaptions that contribute to reproductive success. Consider this question: what is it intellectually that makes a human different from a monkey? There are many things: we have good language ability; we're good at math; we have morality; we are spiritual; we have esthetic abilities that allow us to create and appreciate art; we have inner lives and introspection; we can form abstract ideas and ponder philosophical questions; and so forth. But none of these things are biological adaptions that improve an organism's likelihood of surviving until reproduction. So none of these things can be explained by natural selection. It would seem, in fact, that natural selection theory predicts that such things as these should not even exist. So far from just being a case of natural selection not making predictions that we can verify, the problem seems to be that natural selection theory would seem to make counterfactual predictions about human nature – that you should not have any important characteristics unless they make you more likely to survive until reproduction (in other words, that you should not have most of the things that make you different from a monkey). The difficulty of using natural selection to explain the origin of man's mental capabilities is compounded by the fact that about 200,000 years ago the population of humanity was believed to be small, as few as 10,000. The fewer organisms there are in a population, the more unlikely that there will be enough mutations for natural selection to produce something useful. I may point out here that you could not counter these arguments merely by pointing out some evidence that natural selection occurs. Let's consider three different ideas that can be listed in a table. Hypothesis 1 Natural selection occurs. Hypothesis 3 Natural selection occurs, and is the main cause of new adaptions or features in large organisms such as humans. You do not prove Hypothesis 3 by merely proving Hypothesis 1 or Hypothesis 2. Since the reproduction rate of tiny organisms may be thousands or tens of thousands of times greater than the reproduction rate of large organisms, you don't prove Hypothesis 3 by proving Hypothesis 2. So you can't successfully rebut this post by merely citing something that supports Hypothesis 1 or Hypothesis 2. Given all these problems with the idea of assuming that natural selection is the main cause of evolution in large organisms, why is such an idea being sold as “settled science”? Why are we being dogmatically assured by so many biologists that they understand what caused the appearance of man's higher traits? I think it's a case of premature triumphalism. After first figuring out that evolution is occurring, our biologists should have merely said to themselves: we have completed one lap, but there are still 10,000 laps to go before we understand this. But instead scientists crowned their heads with laurel leaves (and put gold medals around their necks) after completing the first lap – by assuming that the first major book on evolution had also figured out what the cause of it is. It is all too plausible that the actual cause of evolution is some principle or principles far more complex and vastly more deep than the simple idea of natural selection. If we ever understand such a principle or principles, I suspect we will find that it is also the explanation of the origin of life, something entirely unexplained by the theory of natural selection. It is entirely possible that the main thing driving evolution is some natural mechanism far deeper and more sophisticated than natural selection – some mechanism involving undiscovered laws of nature or undiscovered information processes (or both) that tend to work in a teleological or anti-chaotic manner, causing more and more complex things to emerge from simpler things. Nature could have embedded within it some kind of programming (or something that acts like programming), some wellspring of emergence that acts as an antithesis to the Second Law of Thermodynamics, causing ever-increasing order as time passes. Such a principle might be behind the evolution of man's faculties, the origin of life, and the physical ordering of the universe since the time of the Big Bang. Despite the dramatic title suggesting a solution to the age-old problem of the origin of life, when we read the details of the study we find some utterly boring results that aren't even a major step towards such a goal. Some scientists used a procedure involving wetting and drying cycles, and succeeded in combining amino acids into polypeptides that consisted of as many as 14 units. To illustrate how minor this result is, I need merely show a diagram of a polypeptide. 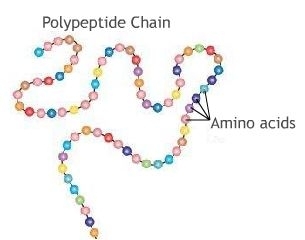 A polypeptide is like a necklace, and amino acids are like beads on the necklace. This result (similar to previous results) is about as exciting as stringing 14 necklace beads onto the string of a necklace, or combining 13 individual playing cards into a bridge hand of 13 playing cards. The study does essentially nothing to answer the main problems in the origin of life, which include the staggering problems of the origin of self-replicating molecules, the origin of the genetic code, and the origin of proteins consisting of thousands of amino acids, not just 14. So what we have here is quite a case of exaggeration by biologists. A press release that should have been humbly titled “Looking for the Origins of Life in a Drying Puddle” has instead been titled “Finding the Origins of Life in a Drying Puddle,” as if scientists have already solved a problem that could easily take them another thousand years to solve. All in all, this press release tends to raise again the question of whether many of our scientists (who often speak as if they were lords of knowledge) may be closer to being “lords of exaggeration.” The truth is that scientists have made relatively little progress in the past 70 years searching for clues to the origin of earthly life. The task of explaining the origin of life using existing paradigms seems all-but-insurmountable. The concepts of natural selection and evolution really offer no help, because neither evolution nor natural selection can get started until life itself begins. As I was typing this post, I was coincidentally watching a TV program in which some astronomers talked about the likelihood of life on other planets. One spoke as if the origin of life was as simple as having the right ingredients. Using similar reasoning, we might vacuously argue that we can explain the origin of a computer program by just mentioning that the electrons that make up that program (when it is stored in a computer) were lying around ready to be used. The problem of the origin of life is a problem of accounting for an “information explosion” that seems inexplicable as a chance event. To get insight on such a thing, we may need a new paradigm that assumes that the information needed for the origin of life was already lurking within the universe, in some mysterious information infrastructure beyond our ken, some cosmic framework involving not just laws of nature but programming. You can't dismiss such a possibility by saying, “That's not allowed, because it sounds like some gift of a deity interested in our existence.” Exactly the same criticism could be made of the theory of gravitation or the theory of electromagnetism, which are equally necessary for our existence. When people wish to exclude others from considering any possibility that might be associated with the paranormal or the religious, such people often use a type of reasoning I might call the “that's religion, not science” argument. Most commonly this is used as a rationale for completely excluding any thought that our universe may be the result of something more than just blind chance. If someone, for example, suggests that the origin of the universe may have been some kind of divine creation, such a hypothesis may be excluded under the grounds that such thinking is not science, but religion. The same reasoning can be used to try to justify a kind of “gag rule” in scientific publications – a rule forbidding mention of anything that might be considered from the world of the paranormal or the religious. Got some evidence that suggests the possibility of some design or purposeful direction in the origin of life or the evolution of life? Sorry, discussing that is not allowed because that's religion, not science. Got some evidence based on near-death experiences that there might be such a thing as a soul that survives death? Sorry, you can't discuss that in a scientific publication, because that's religion not science. Got some evidence that there may be some power of the mind beyond that which neurology can account for? Sorry, you can't present that evidence because that's religion not science. You get the idea. This “that's religion not science” argument ends up being very convenient for the materialist or physicalist, and it has a superficial plausibility. This type of reasoning involves a kind of “science and religion apartheid” thinking. The idea is that there's the science box and the religion box (like two cardboard boxes on different parts of the floor), and that we have to place a particular idea or writing in either one box or the other. Paraphrasing the famous statement about East and West, you might express this assumption by stating this slogan: science is science, and religion is religion, and never the twain shall meet. But is this type of reasoning valid? No, it isn't, as I can show with an important historical example. In the 1920's a Belgian priest by the name of Georges Lemaître first proposed the idea that the universe suddenly began ages ago in a state of inconceivable density that he called a primordial atom. At the time the idea that the universe had a sudden origin was an idea from the world of religion, not the world of science. For one thing, there was no known evidence for such a theory. Scientists favored a different idea, that the universe had existed forever. No doubt many scorned Lemaître's idea, saying “That's religion, not science.” But in the next few decades the evidence for such a sudden beginning of the universe began piling up. Now scientists accept such an idea, which they call the Big Bang theory. So we have here an important example of an idea from the world of religion – the idea of the sudden origin of the universe – that started out as unsubstantiated (not science), but then actually became science (and not just trivial science, but one of the most important findings of modern science). What lesson must be draw from this example? The lesson is: an idea should not at all be excluded from further consideration by scientists merely on a basis such as “that's religion, not science.” This example proves that an idea that originally seems more religious than scientific may end up becoming an important part of science. So the “that's religion, not science” type of reasoning is not valid as some basis for exclusion. But why exactly is this reasoning fallacious? I can give two reasons. The “that's religion, not science” type of reasoning takes advantage of the fact that science is defined in two different ways that are quite different. The first definition is what we may call the “facts on the shelf” definition. People sometimes speak of science as the body of facts collected by scientists. Using this definition, you can attempt to categorize almost all theoretical ideas that scientists discuss as being “not science,” on the grounds that they are not yet proven facts. Just as you can exclude almost everything from the world of the paranormal or the religious as “not science,” you can exclude many scientific hot topics such as string theory, the cosmic inflation theory, the multiverse, neo-Darwinism, and many other theories which are not yet regarded as well-proven as, say, the existence of gravitation or the existence of bacteria. But there's a second definition of science – what we can call the “process” definition. According to this definition, science is the process of seeking truth through systematic efforts that involve observations, experiments, and theorizing. According to this definition, almost anything that involves honest, systematic and well-organized observations, experiments, or evidence-based theorizing is science (whether it be professional science or what is called citizen science carried out by non-professionals). So according to this definition, almost everything that is typically excluded on the basis of being “religion not science” is actually science. That doesn't mean that it's proven to be entirely correct, but merely that it does fall under the category of “the process of seeking truth through systematic efforts that involve observations, experiments, and theorizing,” which is one of the main definitions of science. So, in fact, it is not all clear that those items typically excluded as being “religion, not science” are in reality “not science.” They may well be science (either today or in the future) depending on which definition of science you use. The second major fallacy in “that's religion, not science” type of reasoning is the assumption that the realm of science truth claims and the realm of religious truth claims are mutually exclusive areas that can never overlap to any degree (so that once we have identified something as a religious truth claim it can be excluded as a science truth claim). The assumption may be illustrated by Model 1 in the diagram below. Such an assumption may be incorrect, because there may be some overlap between the realm of religious truth claims and the realm of science truth claims. 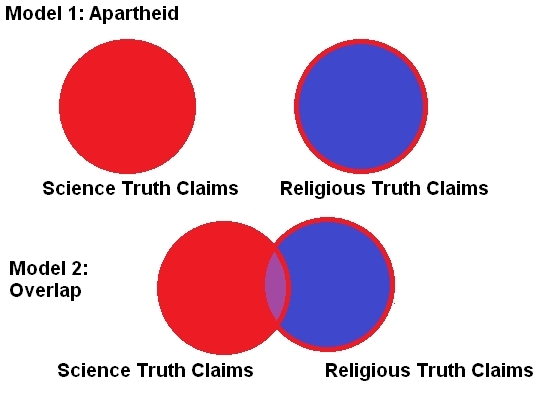 The truthful situation may be as illustrated as Model 2 in the diagram above, in which some truth claims can exist in both the realm of science and the realm of religion. Another reason for thinking that the second diagram is the correct one is that we have the huge historical example of the claim “the universe suddenly originated.” That is a currently a claim existing in both the realm of science and the realm of religion. So this proves there is some overlap between the realm of science truth claims and the realm of religious truth claims. We could easily add another “overlap” example involving claims that the universe is exquisitely fine-tuned. I could make a list of statements along these lines by scientists and religious people, without identifying the person who made the statement; and you would have a hard time distinguishing between the statements by the religious and the statements by the scientists. One might also add as examples of overlap between science and religion some of the items that Fritjof Capra called attention to in his famous book The Tao of Physics: An Exploration of the Parallels Between Modern Physics and Eastern Mysticism. But such a principle is ignored by many who try to keep science as illogically exclusionary as a 1950's Alabama country club. Was the Cambrian Explosion Caused by Extraterrestrials? In his book Darwin's Doubt, Stephen C. Meyer calls our attention to an unexplained anomaly in paleontology. When we examine the fossil record, we don't see fossils appearing in larger and larger sizes, at an even rate of progression between 3 billion years ago and 100 million years ago. Instead, we see relatively little fossil evidence of life prior to the Cambrian era about 500 million years ago. But during the Cambrian era there is a sudden surge of fossils in the fossil record. This sudden blossoming of life during the Cambrian era is known as the Cambrian explosion. The Cambrian explosion is illustrated in the diagram below, from a paper suggesting a prosaic explanation for it. 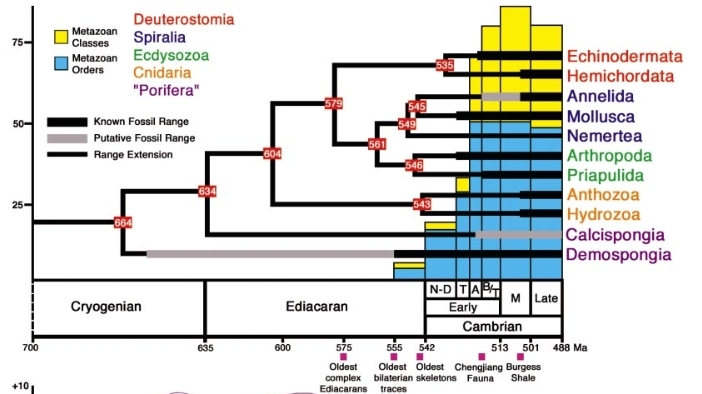 The "known fossil range" lines go back no further than the Cambrian era. Meyer (who has a PhD from the University of Cambridge) argues that this Cambrian explosion is the result of intelligent design at work in the evolution of life. But there is an alternative to assuming a supernatural hand at work in such a thing. Maybe the Cambrian explosion was caused by extraterrestrials. We can imagine a hypothetical conversation that could have occurred millions of years ago, aboard an alien spaceship that entered into orbit around our planet. Xynus: So give me the facts. What is the status of life on this planet? 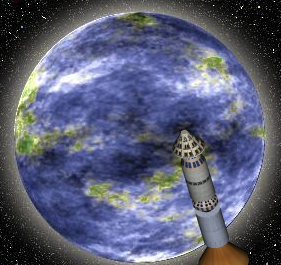 Zeesin: Our underwater robot probes have confirmed that this planet is an evolutionary dud. There's hardly anything here in the way of life. What a waste of time coming here to this crummy little rock! I told you we should have checked out Alpha Centauri instead. Xynus: But maybe we can turn this “dud” into a success. What if we were to accelerate the evolution of life on this planet? Maybe we can turn a dull planet into something where intelligence might eventually evolve. Zeesin: What do you have in mind? Finding some of those dismal organisms in this planet's oceans, and then gene-splicing them to soup up their evolution? That would be a pretty hard chore. You know I don't like to get my four feet wet. Xynus: No, I have something very different in mind. We can create some species ourselves using our nanotechnology biology lab. We need merely specify some requirements, and the computer will take care of designing the appropriate DNA. We can print out the organisms cell layer by cell layer using our molecular materializer. Then we just dump the newly designed organisms into the oceans of this planet. Zeesin: Okay, I guess there's nothing much else to do around here. There are three ages in time when the idea of extraterrestrial intervention might be helpful. The first is the point when the most primitive life developed. Modern science has not yet explained a plausible scenario by which that occurred, partially because of the difficulty of explaining both the origin of a self-replicating molecule and the difficulty of explaining the origin of the genetic code. The second age in time is the Cambrian explosion mentioned here. The third age in time is the time when we saw the emergence of human intelligence. We might call this the “consciousness explosion,” when man seemed to gain in a relatively short span of time (geologically speaking) a variety of subtle mental characteristics such as aesthetic abilities, spirituality, math abilities, language abilities, musical abilities, introspection, and moral reasoning. Accounting for this consciousness explosion is perhaps more difficult than accounting for the Cambrian explosion, given that most of these things are not easy to explain through natural selection, as they are mostly not traits that increase an organism's likelihood of surviving until reproduction. But there is a barrier to anyone suggesting that some design – either extraterrestrial or supernatural – may have played some role in the origin of life or earthly life or human life. Some scientists have declared that any mention of design in discussing such matters is “not part of science” or “unscientific.” This thought taboo is indefensible. A few examples show very clearly that there is no truth to the idea that “scientists don't consider the possibility of design” when trying to consider causes. For example, imagine a strange radio signal is received from deep space. If the signal is sufficiently suspicious, a scientist will indeed consider the hypothesis that design was involved, and that the signal may be a signal from an extraterrestrial civilization. Or imagine that some suspicious looking structure (on an asteroid, moon, or planet) is photographed by a space probe. A scientist will indeed consider the hypothesis that design was involved, and that the structure may have been designed by some extraterrestrial expedition that arrived in our solar system. Or suppose a scientist finds some artificial-looking object buried in a geological bed. A scientist will indeed consider the hypothesis that design was involved, and that the structure may have been designed by some human or some extraterrestrial visitor. Any scientist could advance any of these ideas in a scientific paper without fear of being excluded because he had considered some possibility of design. The notion, therefore, that considering (or arguing for) a possibility of design in discussing the origins of life on earth is unscientific (or not admissible in a science publication) makes no sense. Such claims need to be translated. When a scientist claims that a hypothesis is “not part of science,” what he typically means is that such a hypothesis “is forbidden or should be forbidden to scientists.” When he claims that a particular hypothesis is unscientific, what he typically means is that such a hypothesis is a taboo that violates the tribal norms of the scientific community. Such claims tell us about sociological and cultural restrictions and prohibitions within the scientific community, but usually don't give us any cogent principle as to how our thought should be limited. In my previous post When Rhine and Pearce Got Smoking Gun Evidence for ESP, I discussed a series of tests that provide very good evidence for ESP (extrasensory perception). In 2013 this evidence and other evidence for ESP was attacked in a book by Brian Clegg entitled Extra Sensory. Although Clegg claims in the last paragraph of this book that he was examining the topic of ESP “with an open mind,” his complete hostility toward the topic is made clear throughout his very jaundiced book, which is very much a one-sided tract. Let's take a look at Clegg's attack, and see whether it has any weight. First, let me describe the experiments with Hubert E. Pearce Jr., which were performed at the prestigious Duke University during the 1930's, under the supervision of Professor Joseph Rhine. The main series of tests were tests not of telepathy (also known as mind-reading), but tests of clairvoyance, an ability of a single mind to obtain information through non-sensory means. Both telepathy and clairvoyance fall under the category of ESP or extrasensory perception, since they would seem to involve some kind of anomalous perception that does not involve the senses. The clairvoyance tests done with Pearce (described here) were simple. Two people would sit at a table, the person being tested, and an observer. Twelve decks of cards were put on the table, cards known as Zener cards, that can have one of 5 different symbols on one side (with all the cards having the same appearance on the opposite side). The person being tested would shuffle the cards, and the observer would then cut the cards, assuring that the top cards were random. The person being tested would then hold a series of cards (either 5 or 25) one by one, face down, and guess which of the five symbols was on the unseen side of the card. After the series was done there would then be a stack of either 5 or 25 cards which had been the target of guesses. Those cards would then be turned face up one by one. As each card was turned face up, the observer would record whether the previous guess about that card's symbol was correct or not correct. With a variety of observers and with a variety of testing conditions (some of which would have absolutely precluded the possibility of cheating), Hubert Pearce got astonishing results too good to be explained by chance. Below is the result of these tests. These are tests in which the expected chance result (average per 25) is only 5. Pearce got 3746 correct guesses out of 10,300. We can use the very handy binomial probability calculator at this site to calculate the likelihood of these results. The calculator gives a probability of simply 0 when we type in the overall results, so let's use a subset to try to get some non-zero result. Let's use only rows 2 and 6, involving either Pearce looking away from the cards or a screen between Pearce and the cards, either one of which should have ruled out any possibility of cheating. When I type these results in the binomial probability calculator, I get a result with a chance probability of 5 chances in 100 trillion, which we can round to be 1 chance in 10 trillion. This is a result we should never expect to get by pure chance even if we tested with every single person in the human race. Now what does Clegg say to try to discredit this very convincing evidence for ESP? For one thing, he suggests that Pearce may have got his result by looking at cards seen in someone's glasses. This is a completely illegitimate explanation for any of the results involving Pearce. None of the results (neither the results discussed above, nor the equally dramatic Pearce-Pratt experiment described below) involved one person holding cards while looking at them while someone nearby tried to guess the cards. Clegg's absurd reasoning here is wholly without merit. If one person is sitting directly across a table from another person, and the second person is taking a second to write down which of five guesses was made (which almost certainly would take no more than a few seconds, since it can be done by a one-letter notation), the first person would have a very high chance of being detected any particular time that he tried to peek at the top value of a card deck lying on the table. This is because humans have peripheral vision. If you are writing a one-letter jot on a piece of paper on a table, you can certainly see in the “corner of your eye” with your peripheral vision someone reaching out his hand to peek at the top card in a deck. I may also note that the type of cards used here (Zener cards) don't even have an indication of their value on their corner (unlike playing cards). So you can't peek at the value of a Zener card just by turning its corner – you have to flip the card over or half-turn the card. But in order for Pearce to have got the results that Rhine recorded, he would have had to peek at the value of the cards hundreds of times without ever being detected once by an observer sitting right across from him (and have this happen with a number of different observers). Under such conditions there is no chance that someone would be able to successfully peek at the top value more than about 10 times without being detected, and it is very likely that the first such attempt would be detected. 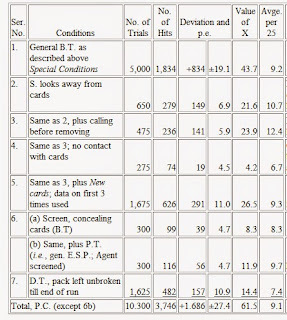 Another reason why Clegg's reasoning is completely without substance is that the table above shows that Pearce got extremely compelling results even in 3 series in which there was zero chance of peeking, one in which he was forced to look away from the observer, and two others in which there was a screen between the cards and Pearce's face. In the two “looking away” series (series 2 and 3 above) he got a total 515 successes out of 1125 (a result which there is basically zero chance of you getting by mere chance). In the two “screen between the cards and the card guesser” tests the results were 215 correct guesses out of 600, which has a probability of less than 1 in 10 trillion (1 in 10,000,000,000,000) according to the binomial calculator I just linked to. Clegg also suggests (without any evidence) that Pearce may have somehow made markings on the cards allowing him to cheat. This extremely implausible suggestion is also without merit, as Rhine's original account of the tests states, “We brought in new cards many times, without there resulting any change in the level of scoring.” The fact that 12 decks of cards were on the table for the tests also means that card markings cannot explain the results. Clegg also suggests that Pearce “had the opportunity to take a quick look at the whole pack while not being observed.” This suggestion is also without merit because the protocol involved cards that were shuffled and cut before anyone guessed about their value. Having discussed the Pearce-Rhine clairvoyance tests, and having offered no objections with any substance, Clegg goes on to discuss the equally compelling Pratt-Pearce tests on telepathy. The format for these tests was very different. A person called the observer (Professor Pratt) shuffled a deck of Zener cards, and at particular intervals would turn the top card and record its value. The person being tested (Pearce) was in distant location 100 yards away or even farther away. The person being tested had instructions to begin guessing which card had been turned, beginning at a particular time known to both the observer and the person being tested. After a particular length of time had passed, both the observer and the person being tested would hand in their written results to a third person, who would check and see how many of the guesses were accurate. The tests (described here) were run from August 1933 to March 1934, totaling 74 runs through a pack of 25 cards. The rate of card guessing was 1 per minute. The total amount of time that Pearce spent guessing cards was about 30 hours. 1850 cards were dealt, and the expected chance success rate was about 370 cards. Instead, Pearce got 558 correct guesses. The results of the test are shown below. The final column P shows the probability of getting these result by chance, which was about 1 in 1022 or 1 in 10,000,000,000,000,000,000,000. To try to debunk this result, Clegg suggests the idea that Pearce secretly sneaked over to Pratt's office, and then peeked over a crack at the top of the door. He restates an old idea that Pearce may have peeked through a transom at the top of Pratt's office. This suggestion is not at all credible for several reasons. For one thing, there's a 99% likelihood that no one would ever attempt so risky a procedure. Then there's the 99% likelihood that if someone did attempt such a procedure, he would have been detected by Pratt (or by Rhine, who joined Pratt for one of the series). If you are close enough to see the values of cards being turned by peeking through a transom, you are close enough to be heard or seen by the person turning those cards (partially because standing on a chair for long periods inevitably results in chair squeaks that can be heard). Then there's the fact that if you were to spend hours peeking through a transom at the top of a door (which would require standing on a chair), there's a 99.9% likelihood that you would be detected by some passerby, who would either report this suspicious behavior to the professor, or ask aloud “why are you peeking through that transom,” which would give you away (the halls of universities tend to have lots of foot traffic at all hours of the day). So this transom objection is not a reasonable reason for rejecting the Pearce-Pratt result as being convincing evidence for ESP. The dismal failure of Clegg's debunking efforts can be shown as follows: suppose we accept both this enormously implausible “transom peeking” idea and also the infinitely more implausible idea of hundreds of card deck peeks going unnoticed by an observer directly across the table (which is rather like assuming that someone can really jump to the moon). 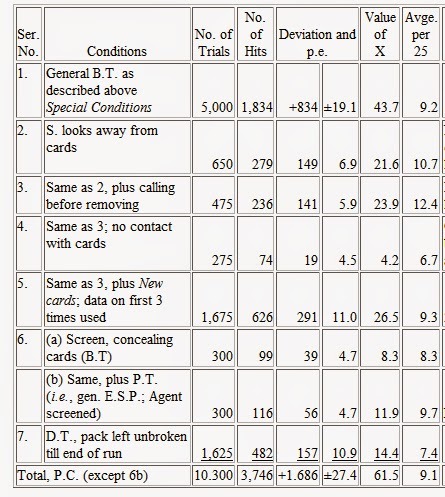 Then you still have not explained away the evidence for ESP involving tests with Pearce – for even then you still have no explanations for the extremely compelling evidence produced when there was a screen between the card guesser and the cards (series 6 listed in the first table) – tests in which there were 215 correct guesses out of 600, which has a probability of less than 1 in 10 trillion (1 in 10,000,000,000,000). The evidence discussed here involving Hubert Pearce is only one piece of a great mountain of evidence showing the reality of ESP. Another very important piece is the ganzfeld studies done in recent decades. Repeated many times by many experimenters, these studies have consistently shown that subjects undergoing sensory deprivation are able to score at a rate of between 30% and 32% on tests in which the chance result should only be 25%. This is overwhelming evidence for ESP. Clegg is not able to debunk this evidence. His approach is basically to look for anything at all which he regards as a discrepancy between the way he would ideally do such a test, and the way the test was done, and to call that an error. The same type of reasoning might lead someone to say that your SAT score is not reliable because there was the “error” that there were not steel walls between yourself and the test takers to your right and left. Clegg concentrates on mentioning issues with the early versions of the ganzfeld experients. But the designers of these experiments closely worked with skeptics, and came up with a joint statement agreeing on protocols that should be followed henceforward to assure the reliability of these experiments. Even after these tightened-up protocols were put in place, the experiments continued to get results showing dramatic evidence of ESP, with the subjects achieving success rates between 30% and 32% far in excess of the 25% success rate they should be getting if ESP does not exist. As wikipedia.com reports, “In 2010, Lance Storm, Patrizio Tressoldi, and Lorenzo Di Risio analyzed 29 ganzfeld studies from 1997 to 2008. Of the 1,498 trials, 483 produced hits, corresponding to a hit rate of 32.2%.” That is a rate far above the expected chance rate of 25%. See the pdf here for a meta analysis reporting the 30% number. Contrary to the impression Clegg tries to create in his 2013 book (with some blatant cherry-picking that omits results after the year 2000), the spectacular success of the ganzfeld experiments have continued even after the procedures had their protocols tightened-up. These recent tests between 1997 and 2014 provide very good evidence for ESP, as the likelihood of you getting these results by chance is much less than 1 in a trillion. Why is it that Clegg takes five pages to discuss the ganzfeld experiments, without taking a sentence to state the results they got (a sentence like this: the chance expectation was 25%, but the results were between 30 and 32%)? It's kind of like someone arguing that Ty Cobb was a poor hitter, and conveniently failing to mention Cobb's batting average. The evidence for ESP is overwhelming, and continues to accumulate. This evidence holds up very well to Clegg's unsound assault, which consists mainly of the noise of blank shells firing. Besides abundant anecdotal evidence that frequently crops up in human experience (such as when we think of someone who rarely calls on the phone, just before he calls on the phone), there is over 100 years of compelling published scientific evidence, involving a very large number of subjects. At last year's conference of the Parapsychological Association, Dr. Diane Hennacy Powell presented a paper describing a test with an autistic child, a subject producing results as spectacular as those produced by Pearce in the 1930's. As discussed here, she showed a long tape of an experiment with this subject at the conference, one demonstrating spectacular results. As discussed here, she is currently working on a more polished film that will present these results to the general public. A preliminary video of previous experiments with this autistic child can be seen here. Knowledge Lords or Lords of Exaggeration? There is an intellectual sin that is very common among many modern scientists: the sin of speaking as if they had explanations that account for long-standing puzzles of nature, even if they don't really have such explanations, but at best merely have small fragments of such explanations. Imagine a person who doesn't have a blanket, but merely has some threads picked up from various places on the floor. Such a person might try to call those threads a blanket, or most of a blanket, but that would be quite an exaggeration. Similar to such a person, many a modern scientist speaks as if he is some great knowledge lord who has mastered some deep puzzle of nature, when he is merely someone familiar with a few things that might be fragments of the solution of such a puzzle (like individual pieces of a 50-meter-long jigsaw puzzle). I read an example of this type of exaggeration today in a post by cosmologist Ethan Siegel. Siegel makes this claim: “The inflationary Big Bang Universe, with radiation, normal matter, dark matter and dark energy, explains the full suite of absolutely everything we’ve ever observed, and nothing else does.” Is this statement true? No, it's a ridiculous case of overselling a very patchy theoretical framework. First, the inflationary Big Bang universe theory does not explain the origin of the universe itself, leaving it as a complete mystery. Second, there are many important physical things unexplained by the inflationary Big Bang theory -- things such as the hierarchical structure of the universe, the CMB cold spot, the persistence of spiral galaxies, and the fine tuning of fundamental constants that makes possible a habitable universe. Third, we have no real understanding of either dark energy or dark matter. Neither is part of the Standard Model of Physics. The very terms “dark matter” and “dark energy” are pretty much just euphemisms for “some kind of mysterious something that we know nothing about.” So claiming that explains something (or is part of an explanation) is erroneous. When physicists and cosmologists actually do calculations relevant to the issue of dark energy, they get a shocking result: that the vacuum of space should be filled with a dark energy or cosmological constant more than a billion trillion quadrillion times (more than 1,000,000,000,000,000,000,000,000,000,000,000,000 times) larger than we observe. This is the completely unsolved “cosmological constant” problem (sometimes called the vacuum catastrophe) that has long haunted physics and cosmology (it is discussed here). Claiming that dark energy is part of some explanation of “absolutely everything we've ever observed” is hilarious. Better to say that dark energy is part of the reason we can't even explain the simplest thing we can think of (the vacuum) – because according to physicist's calculations the vacuum should be so packed with dark energy that it should have more mass-energy than solid steel. There are other fields of inquiry in which scientists claim to understand puzzles of nature they do not understand, by trying to exaggerate what they have learned. One such field is the field of biology. Here the most prominent cases of explanatory exaggeration involve evolution and natural selection. We commonly hear scientists speak as if evolution is some magic potion that explains “in one fell swoop” how it is that there came to be beings such as us on this planet. But it isn't. While evolution and natural selection are very probably important pieces in the puzzle of the origin of intelligent life on our planet, they are probably no more than pieces in that jigsaw puzzle. For one thing, neither evolution nor natural selection can explain either the origin of life or the origin of the genetic code. That's because both evolution and natural selection require life itself, and you can't explain the origin of life by something that requires life. Moreover, humans have many special mental and spiritual capabilities that are extremely difficult or impossible to explain by natural selection or evolution. Humans have inner selves and personalities. Humans are great at language, and at formulating very abstract ideas. Humans are capable of wonder, joy, love, guilt, compassion, imagination, and spirituality. 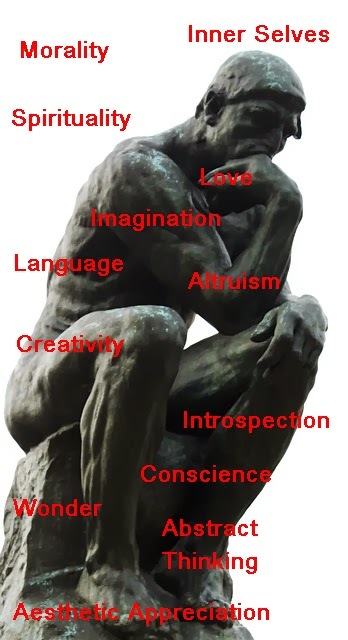 Humans can create art and literature, ponder their own deaths, wonder about the meaning of life and the nature of the universe, create and follow moral codes, and consider philosophical matters. As argued here, it is hard to explain most of these things by evoking evolution or natural selection, because most of them have no survival value, from an evolutionary standpoint of making an organism more likely to survive until it reproduces. How did humanity get these things? We don't know. The modern biologist offers an unconvincing, simplistic explanation – “it all just came from evolution.” But the actual explanation is probably far deeper and more complex. I can understand why the biologist would wish to offer this answer of “it all just came from evolution.” It is always better to be able to say, “I have the answer to this great mystery of nature,” than to say, “I have but a few tiny fragments that may one day be of use in solving this great puzzle.” It is always more pleasing to put yourself on a pedestal marked “Great Lord of Knowledge” than to humbly realize that the puzzles of nature vastly exceed your meager understanding. If you point out the explanatory limits of evolution to a biologist, you may be attacked as an evolution denier, even if you did not at all deny it, but merely pointed out its explanatory limits. Another example of inflated knowledge pretensions involve claims about the human brain. Scientists have done some brain imaging studies showing how parts of the brain light up differently under different conditions. If you read some enthusiastic reports of such studies, you might get the idea that scientists have a deep understanding of how our brains work. But they don't. Brain imaging meta-studies show that when the results of a number of experiments are pooled, the typical result is to show activations over most of the brain, rather than convergence on a single location... Considerable portions of modern cognitive neuroscience's empirical research support the idea that every cognitive process is a product of the action of a highly integrated system in which many parts of the brain interact rather than function independently as isolated regions...There has been little replication of most findings...No part of the brain has only a single, unique function...Clinical data, especially with traumatic injuries, do not display high degrees of correlation between particular brain lesions and cognitive states. It would seem that those who claim to understand the brain through some kind of “this part does this thing” approach are exaggerating their understanding, and that the brain is still a deep, intractable mystery. Indeed, there is every reason to suspect that we are centuries away from being able to understand the brain's secrets. How is it that these examples of knowledge hubris become so widely accepted? How is it that again and again our scientists get people to think that they are knocking on a door marked “Final Explanation” when they have often just walked a few paces down the long, long road that leads to that door? Part of the reason is that it's like a school where there are no teachers to give scientists grades, and they can make their own grades. Imagine if you were at a school without any teachers, one in which you give yourself a grade. You might learn just a few facts about modern history (such as the fact that soldiers landed on a beach on June 6, 1944, and the fact that some bombs were dropped on December 7, 1941). You might then conclude that because you had learned these things, you now had a deep understanding of modern history, and give yourself an “A” in the Modern History course. There would be no one around to say, “no, no, you have learned just the tiniest fraction of what you need to know to understand that topic.” Similarly, there is no one around to correct the scientist who fancies himself a knowledge lord after learning but a few paltry fragments of nature's vast and deep secrets. Science 2.0 or Hate 2.0? The theory of homeopathy is not one that I profess belief in, and at this time I do not recommend making crucial medical decisions based on it. But I do think it is an interesting hypothesis that might be worthy of further study. A better name for the theory might be to call it a hypothesis of anomalous aqueous traces. The idea behind homeopathy is that if you take water and put certain chemicals or medicines in it, and then dilute the water repeatedly, until no recognizable trace of the original ingredient is left, then somehow the water retains some beneficial effect from these earlier ingredients – almost as if the water somehow “remembered” what was previously in it. To a materialist scientist, such an idea is a pure abomination. But it could just possibly be that such an effect occurs, if there are mysterious unknowns involving water that we are ignorant of. Water is a most astonishing substance which is a great example of unpredictable emergence. There are many unusual properties of water (some of them vital for our existence) that are not at all predictable from merely considering the things that water is composed of (two hydrogen atoms and an oxygen atom). Considering that fact, it does not seem so implausible that water might have some unknown abilities which we are ignorant of, including just possibly some ability to store traces of previous ingredients in some anomalous way. There actually seems to be evidence suggesting that inanimate objects may be able to somehow hold anomalous traces of information. Such evidence falls under the category of what parapsychologists call psychometry. Psychometry allegedly involves a mysterious ability to hold some old object, and tell information about facts associated with that object, such as incidents it was involved with, or previous people who owned it. The idea seems outrageous, but significant evidence has been gathered to suggest such a thing may actually occur. For example, anthropologist David E. Jones was able to find four people who did surprisingly well when asked to provide information relevant to artifacts and fossils that they were asked to touch. In one case, three subjects were given nondescript rocks gathered from a Mayan site, and the subjects were able to describe a site and culture like those where the rocks were taken from. The idea of anomalous invisible traces may not seem so outrageous if one considers an interesting scene from a famous movie. In the classic Alfred Hitchcock thriller North by Northwest, there is a scene where Eva Marie Saint and Cary Grant are in a hotel room. Talking on the phone, Eva writes down a number on a notepad, rips off the top sheet of the notepad, and departs. Cary needs to get that number, but it now seems impossible to do so. But it is actually possible – because of an invisible trace of the phone number. Cary takes the notepad Eva used, and fills the top page with pencil scratches. Holding that top page to a light, he sees a previously invisible trace of the phone number. It is not unthinkable that nature may have hidden within it something equivalent to that page – something that stores information on previous states of material objects. If such a thing exists (as psychometry evidence suggests), then a hypothesis such as homeopathy may not be so unthinkable. But such possibilities cannot be conceded by the critics of homeopathy. One of these critics has recently escalated his loathing for homeopathy into a shocking new level. He has flatly stated that all those who believe in homeopathy are mentally ill. This statement was made in a recent post entitled “Homeopsychopaths.” The post was approvingly published on two web sites run by scientists, the "Science 2.0" site at Science20.com and the site RealClearScience.com. It must be noted that this type of deplorable hate-mongering may be a serious warning sign. During the 1930's people in Germany began publishing inflammatory claims about Jews. The next step a few years later was to start smashing the windows of Jewish stores, and the next step after that was to lock up the Jews in concentration camps. When an authority tries to punish deviant thought by claiming that all who hold such opinions are mentally ill, it almost makes me wonder whether there is any chance that this is a first step in a path that may eventually lead to enforced confinement of those who hold views that deviate from materialist orthodoxy. Think that such a scenario could never happen? It did happen in the Soviet Union. 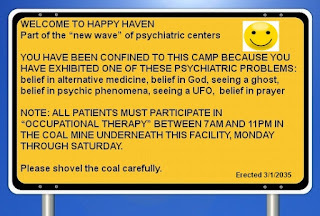 For many years one of the many “symptoms” that could cause you to be confined to a Soviet psychiatric center was the supposed “mental illness” of holding anti-materialist views. 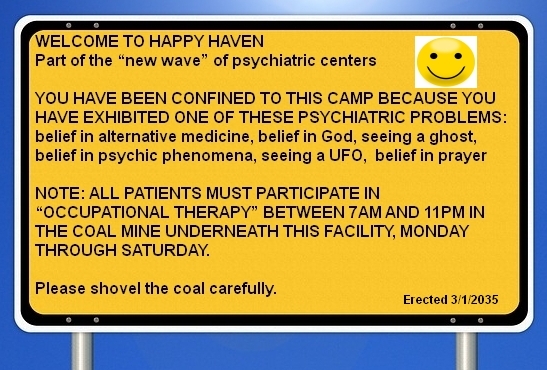 Let's hope that if this happens in America, it never gets as bad as suggested by the following sign, which depicts a “psychiatric hospital” decades in the future.